Dear children and others, we are informing you that everything is in the best disorder, and so we are again meeting you in this next book from the Tales About a Doggie and a Pussycat, which is all about the two of us, written by the author Mr. Josef Čapek. We want to add to this that we are both very happy that he had portrayed us so nicely in his pictures. 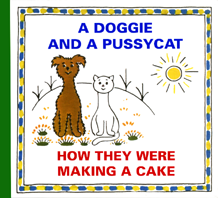 This new book about us is named How They Were Making a Cake, because once we really made such a big cake since as it happened we both had a name day and a birthday at the same time. However, it was also for the last time, because we found out that we should not overdo even a good thing; but we can’t reveal more because then you would easily guess how all of this ended. So have a good read and perhaps don’t show our recipe for a real proper cake to your mum. Ask her instead to make you a cake for your name day or birthday from her own head, or from a cookery book. Good appetite! So cheerio and regards Yours PUSSYCAT and DOGGIE Kniha vázaná,NOVÁ, jen skladovaná. Celostránkové kresby J.Čapka s textem. Anglicky.